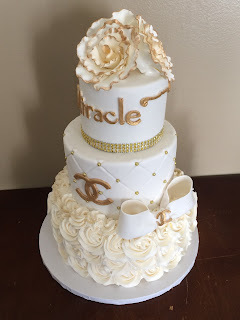 Well another busy week of caking has past and I am back to showcase like I said I would the white and gold version of the pink and silver chanel cake from the other week. I actually think I like this version better. I think it may because of the combination of white and gold gives it an air of sophistication. You all can let me know what you think. 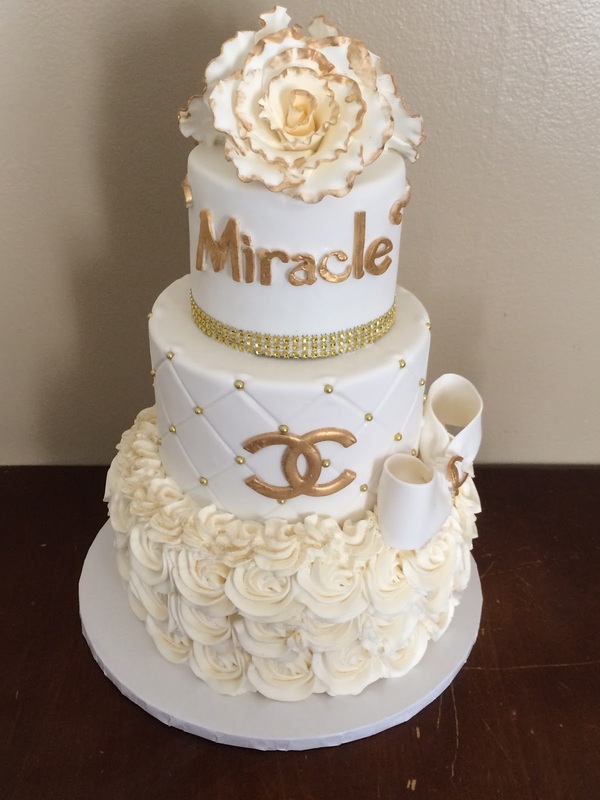 Its a 3 tiers covered in white fondant with gold accents on the top two tiers. Each tier is a different flavor; chocolate, vanilla and red velvet in the order. The bottom tier has buttercream rosettes and then sprinkled with gold glitter to give it some extra shine. The top tier has gold rhinestone banding around the bottom. The bow is made from gumpaste and has the chanel logo in the middle. The middle tier has gold edible beads at each intersection point of the quilted pattern. The hubby delivered the cake and he said the client was so happy as this was all done over the internet because she lives in a different state and was coming up for her sister's baby shower. Love when everything works out and the clients are super pleased with their cakes.